Note: This review originally appeared in the Illinois Entertainer. 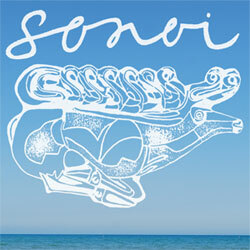 The Chicago trio Sonoi exhibits a split personality on its self-titled debut, alternating from appealing indie rock songs to moody instrumentals laden with synthesized gimmickry. Vocalist-guitarist Adam Busch and bassist-keyboards player Ryan Hembrey are veterans of the band Manishevitz, and along with drummer Pierce Doerr, they keep things interesting through three quarters of the CD. But the last four tracks come across as self-indulgent and seem to drag on forever. “Anchor Tattoo (Roll George)” has exotic synth beats and haunted vocals, but this 10-minute dirge wears out its welcome long before it’s over. Worse yet, it’s a passageway from the catchy, guitar-driven songs like “Sherry Fall” and “Eva Baton” to the prog rock noodling of “Rotativa” and “Friends In Dry Places.” “Clouds,” a cutting edge gem that recalls 1980s guitar bands like Wire Train and Translator, shows Sonoi at its best, and the catchy “Cat And The Barbie” serves up some offbeat fun. For The Benefit Of Mr H.
Power Pop Bash Returns To L.A.